It’s summer, and it demands ice-cream like no other time of the year. While mangoes are in season, it seems to be the most obvious choice of flavour, and chocolate, well, chocolate is unbound by season or time. It is in style all year round, and will be for as long as PMS exists. But why not try something a little different? 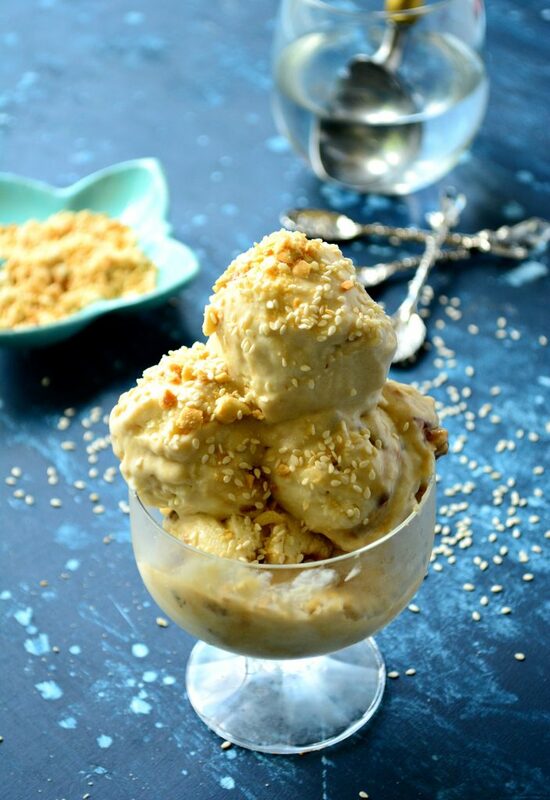 This Sesame & Jaggery No churn Ice-cream is as different as it gets. 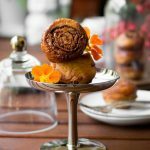 Inspired by Indian flavours – extremely reminiscent of the ancient and timeless Sesame seeds and Jaggery balls that we all grew up eating, except in the form of ice-cream. Ice-cream that tastes like Ellurundai (ellu urundai) – fascinating, isn’t it??? Sesame seeds are one of the healthiest foods in the world. In Tamil, sesame oil is called ‘nallennai‘, meaning ‘good oil’. Sesame reduces levels of cholesterol in blood, improves bone health and lowers risk of colon cancer. Jaggery is unrefined sugar, generally cane sugar. 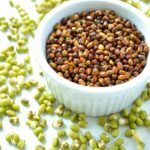 High in iron and fiber, it reduces body heat, is a respiratory cleanser and used in household remedies for common cold, and is a complex sugar and doesn’t increase blood sugar levels as much as regular, refined sugar. This summer, give something new a chance – a new flavour that might just end up on your favourites list! And all you need are 5 simple ingredients! And no ice-cream maker required! Begin by roasting sesame seeds and grinding them to a powder. The oil releases with the grind, but don’t worry about that. 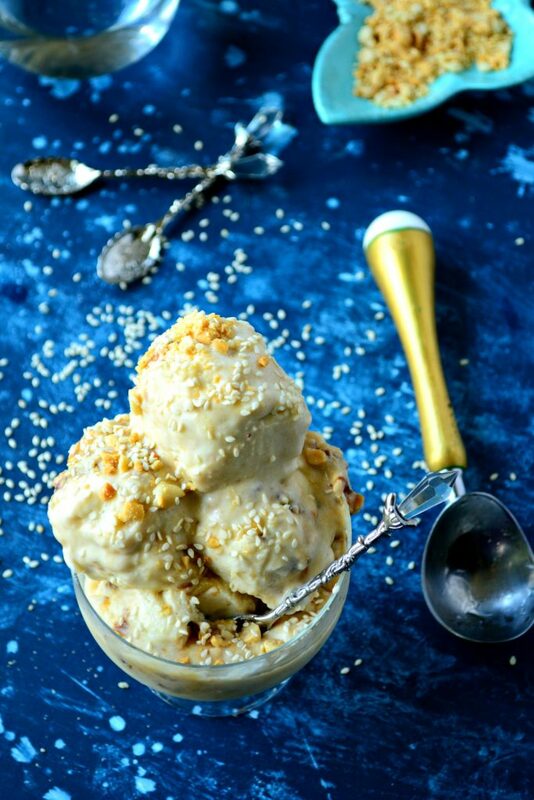 And ice-cream to me, no matter the flavour, is never complete without the crunch of nuts – and traditionally, the sesame & jaggery balls were allowed a handful of peanuts. And I stick to tradition, in a matter of speaking…. These roasted peanuts were crudely crushed in a mortar and pestle. Whisk heavy cream till you see soft peaks. It’s best done when the cream and anything it touches is cold. I put the bowl and whisk into the freezer and use chilled cream. While whipping, I also place the bowl over an ice-bath. Cold is the key to whisking cream. Once you see soft peaks, fold in the sesame powder, condensed milk and whisk until it thickens considerably, but remains creamy and smooth. Fold in a handful of peanuts and refrigerate. 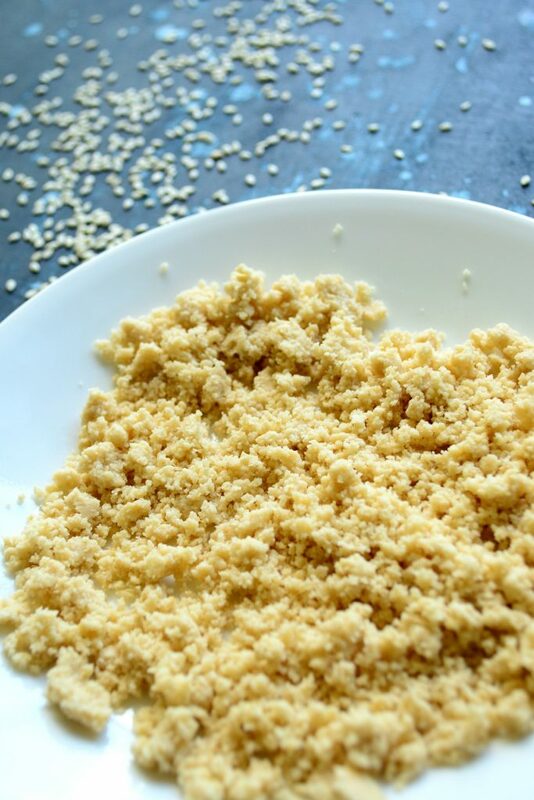 In the meantime, prepare the jaggery sauce by melting grated jaggery in a little water and bringing to a boil. When you see the whole thing bubbling, remove from heat and cool a little. If its completely cool, the thing will get hard, so lukewarm is good enough. 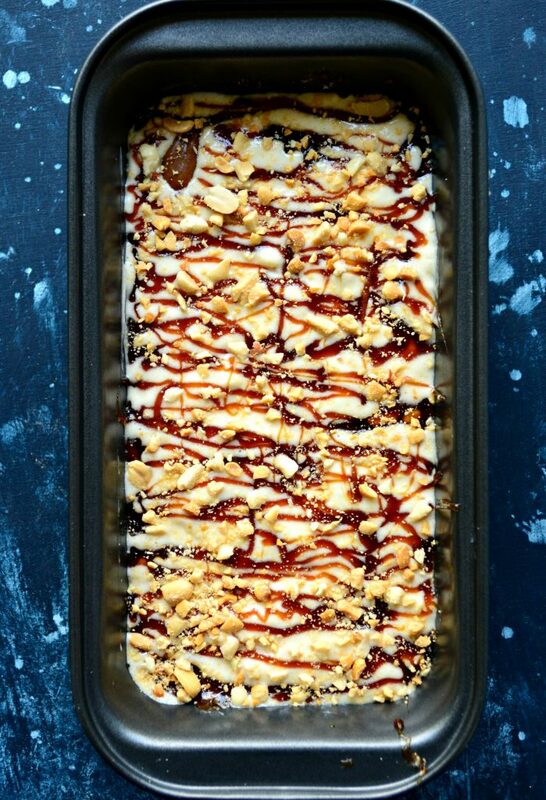 Spoon over half the sesame ice-cream mix into an 8 inch tin and sprinkle some more peanuts. Drizzle half of the warm sauce over the ice-cream mixture and spoon over the remaining ice-cream. More peanuts and the rest of the sauce. Today was an exceptionally torturous warm day in the South – I could hardly get a couple of shots before it started melting! So I did the only logical thing I could think of – I ate them all! And it was GOOOOD! Exactly like an ellurundai (ellu urundai) – the nutty sesame with a vague hint of bitterness, and the earthy sweetness of the jaggery all packaged into a creamy, cold and delicious ice-cream that takes you no longer than 30 minutes to make (plus the freezing time). And as you take in bite after bite, you’ll get the crunch from the peanuts and scattered bits of jaggery caramel. Mmm hmm! Dry roast the sesame seeds on medium heat till fragrant and begins to turn color. Transfer to a plate to cool. Once cool, grind to a fine, sticky powder. Chill the bowl and whisk before you begin to whisk the whipping cream. Place the chilled bowl over a bigger bowl of ice to keep the temperature of the cream cool as it whips. 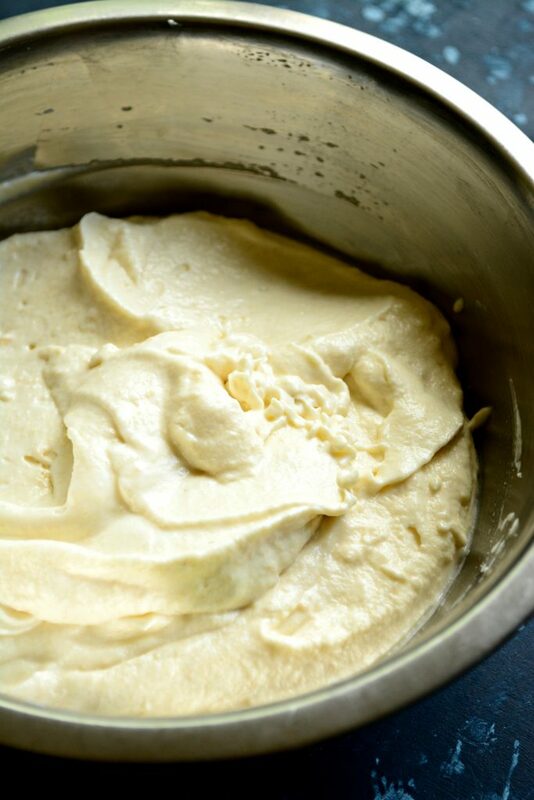 Pour in the cold cream into the cold bowl placed inside an ice bath and whisk until you see soft peaks. Into the whipped cream, gently fold the condensed milk, sesame seed powder and 1/3rd of crushed peanuts. Refrigerate until the jaggery sauce is ready. 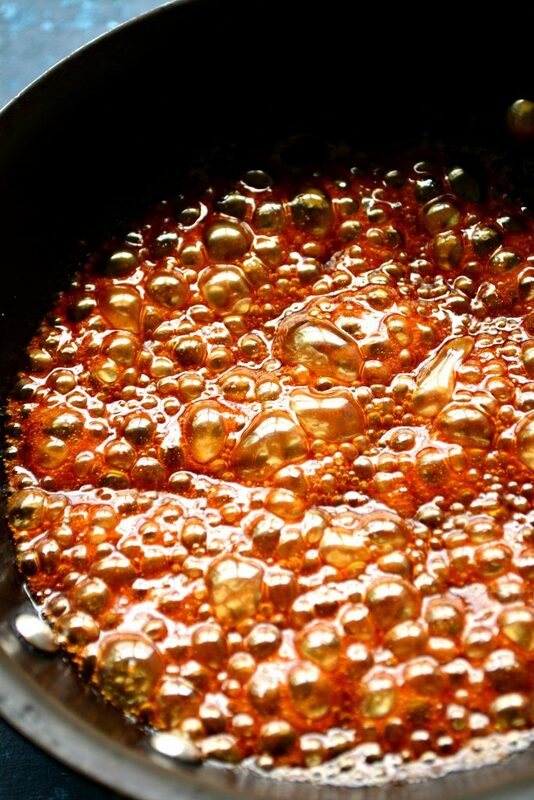 Heat the grated jaggery in a small pan and let it melt over medium heat. You can speed this process by adding 1/4 tbsp of water. After a couple of minutes, you'll see bubbles forming around the edges spreading over to the entire surface, thickening the syrup further. Once thick enough (but pourable), remove from heat and cool slightly. Transfer half the whipped sesame cream into an 8" rectangular pan. 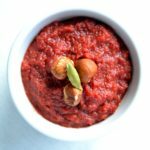 Drizzle half the sauce and sprinkle a little of the remaining crushed peanuts. Spoon over the remaining whipped sesame cream and drizzle the remainign sauce, and a little more peanuts. 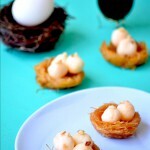 Reserve some peanuts for garnishing as you serve. 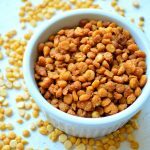 Freeze for atleast 5 hours or overnight preferably. Previous Post: « A Foodie’s Travelogue #5 – The Baltimore Weekend! Thanks so much Jo! 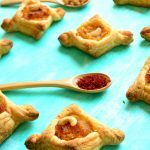 I absolutely loved these flavours, and I’m sure you will too! Try it and let me know how you liked it…. I’ve never had sesame seeds in an ice-cream but it sounds like such a delicious idea and so tasty with the jaggery and peanuts too! It really was Corina! I hope you try it! 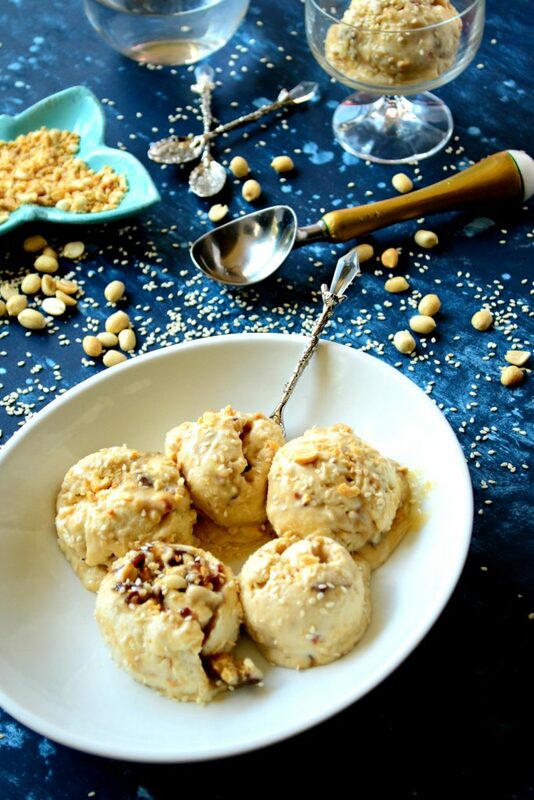 I have made ice cream from tahini before, so I can imagine how delicious this one tastes! Beautiful photography, too. Oooo ice-cream from Tahini…. that sounds super interesting!!! Thanks Lauren, you just gave my my next thing to try! 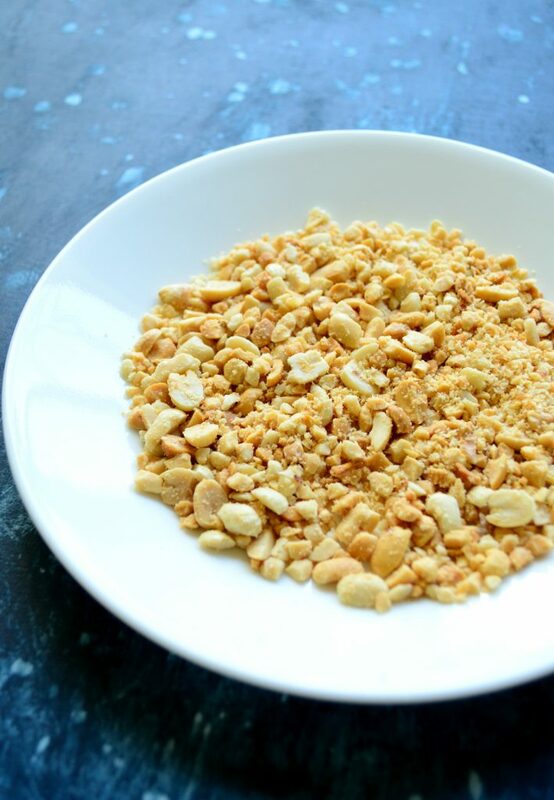 Please do Dahn, jaggery is healthier than sugar, and is super rich in Iron and has a very earthy taste – like the smell of earth after the first rains…. You’ll love it! 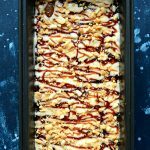 Oh man- I’ve been looking for some new no churn ice cream recipes! This sounds fantastic! I love sesame seeds! Thanks Sarah! It was super delicious!